A day has 24 hours, and a pretty good chunk of that time is spent sleeping. Recharging our batteries is very important and having the right type of bed at your disposal makes a world of difference. That being said, many are interested to know what kind of beds are available and how does one differ from another. While there are a lot of bed type variations, there are a few archetypes if you want to call them that. Human innovation has made it possible for people today to own very interesting bed types that are also very smart and practical. But enough talk, it’s time to look at some specific beds and see what they offer. 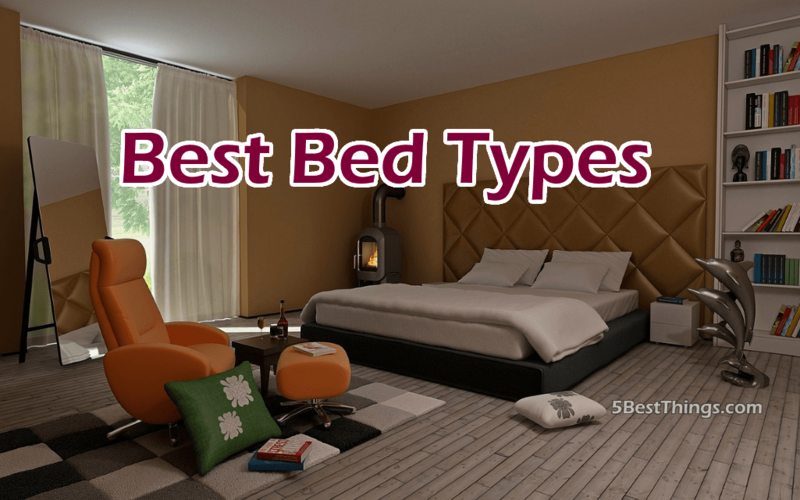 Here are some of the most popular bed types available, and also the most useful. Bunk beds are very useful in situations where space is a problem. Need to fit two beds into a room but don’t have the space? Just put them on top of each other. That’s exactly what bunk beds achieve and that’s why they are some of the most practical bed types available. Most people know of bunk beds as convenience beds that are used in less than adequate or fortuitous situations where people have to share beyond their will, like prison or even student housings. That’s not necessarily the case with retail-bought bunk beds for your own house. They can be very classy and especially comfortable while also saving a ton of space. Sofas are great because they offer a comfortable space you can sit to watch TV, play a game or just kick your boots up. You can even sleep on them although it’s not exactly an ideal situation. Moreover, sofa beds are more than sofas; they are sofas that can extend into full-size beds. This is a great win in terms of space and also convenience because you don’t have to buy both a bed and a sofa; you can buy a sofa bed and save lot of money in the process. There is also the detail that sofa beds offer the possibility of creating interesting situations like having a sofa in the bedroom or a bed in the living room. Divan beds come with a unique feature that focuses on the same theme of comfort and space saving at the same time. With this type of beds, owners can store whatever they want in a large compartment found in the middle of the bed. The bed is made of three layers. The bottom layer or bottom half is made of wood. The middle one is the container but also the bridge between the bottom side and the top layer. It’s extremely efficient for depositing stuff and also catching a good night’s sleep.